1860 Atlas showing location of Garrison families in Camden Twp. (Camden East), Lennox-Addington Co., in relation to VanValkenburgs. The lot locations correspond to the 1851 Agricultural Census. Note, this map was drawn ten years later. Reproduction of an original copy of the Map of United Counties of Frontenac, Lennox and Addington, Canada West, by H.F. Walling, Putnam & Walling Publishers, Kingston, C.W., 1860. Accompanies an article about VV United Empire Loyalists who were neighbours of Lieut. Gysbert Sharp who defended their Loss claims after the Revolution. ATLAS- HALTON Co. (Trafalgar Twp.) & PEEL Co. (Toronto Twp.) 1858/9 Geo. Tremaine. Shows St. Peter's Anglican cemetery and Munn's United Cemetery, and the VV relatives on their lots along Dundas St. From east to west: Ira VV, Eleanor (Conover) widow of Moses Teeter and George Phoenix, Samuel Conover husband of Lovina VV, Abraham & George Phoenix (Fenix). The VV's in this area started out as members of the Anglican church, as it was the only church available, but most converted to Methodism. Historical Atlas of the Long Lake area of Olden Twp. and the future location of the village of Parham to the south in Hinchinbrooke Twp., Frontenac Co. in 1860. Shows property of S. "Valkenberg" (Sylvester VV) in 1860, above Long Lake at Con. 5 Lot 2 Olden Twp. For modern location, enter 44.678052,-76.789284 into Google Maps address bar. This location is noted also in the 1865 list of VV land holdings written by Dr. H.C. Burleigh. For location of Parham village 44.656443,-76.717186. Parham is recorded as the burial place of Sylvester VV's mother Asenath Vosburgh. On this 1860 Atlas no village shows, but my guess is that it is at the location marked "inn" just south-west of Eagle Lake. The 1878 Meacham Atlas did not publish landholder names for the northern townships, but a general overview map of Hinchinbrook Twp. shows a dot for Parham. Note the Cronk family in the vicinity, in particular S. Cronk as co-occupant of the lot with Sylvester VV in Olden Twp. but also an S. Cronk in the bottom-left section of this map on what is Con. 6 Lot 24 of Hinchinbrooke Twp. This is the future home of Cecilia Switzer-Cronk, a grand-niece of Sylvester VV. Map of United Counties of Frontenac, Lennox and Addington, Canada West, by H.F. Walling, Putnam & Walling Publishers, Kingston, C.W., 1860. Historical Atlases of the Battersea area of Storrington Twp., Frontenac Co. in 1860 and 1878. Shows property of D. VanVolkenburgh and H. VanVolkenburg on Con. 8 Lot 13 at Milburn village. For modern location, enter 44.416862,-76.370087 into Google Maps address bar. See a list of other nearby VV locations and a depiction of the Tannery at the adjoining property. Illustrated Historical Atlas of the Counties of Frontenac, Lennox and Addington, Ontario, by J.H. Meacham & Co., Toronto, 1878. Historical Atlases of the Moscow area of Camden Twp., Lennox & Addington Co. in 1860 and 1878. Shows property of P. VanValkenburg in 1860, a house at the SW corner of Moscow village (suppose this is Lot 44). For modern location, enter 44.428815,-76.807909 into Google Maps address bar. See a list of other nearby VV locations including Paulus VV's brother Gilbert's land at Varty Lake to the south. Also note the location in Moscow of the Friends (Quaker) Meeting House, and the cemeteries on either side of the road leading south. Historical Atlases of the North Reach of Loughborough Lake area of Storrington Twp., Frontenac Co. in 1860 and 1878. The first map is from Ontario Archives RG 1-100 Patent Plan maps with an undated but early survey showing original patentees of Crown Lands. David VanVolkenburgh is shown in this location Con. 12 Lot 12 in what was then Pittsburgh Twp., now Storrington Twp. What is now known as VanVolkenburgh Island is circled. The 1878 atlas shows property of a "W. VanVolkenburgh" on Con. 12 Lot 12; however no settlers in this location at the 1860 date. The VV family are located in 1860 and 1878 at their farm in the 8th Concession near Milburn village. New research indicates that ownership of this 12th Concession area north of Battersea was transferred in 1875, after David VV's death, to his eldest son and heir - Washington VV. The land transfer represented the surviving widow and siblings ceding their inheritance rights to Washington for the nominal sum of one dollar. The document also states that this lot had been an original Crown grant. Any further research into such a grant, might be searched within Storrington AND Pittsburgh Twps. and under VV/Vollick/Follick or Miller surnames. Lot 13 adjoined to Lot 12 in later maps, includes the island, circled on the maps, that has retained its modern identity as VanVolkenburgh Island! To locate this island, enter 44.4797222, -76.3738888 in Google maps address bar, and zoom in as the name appears. A modern map now shows the island just north of the peninsula. The much larger island, just beyond VV island on the old maps, may be now sunken, with a shadowy form showing in satellite view on Google maps. Patent Plan Map: Pittsburgh Twp. (now Storrington Twp. 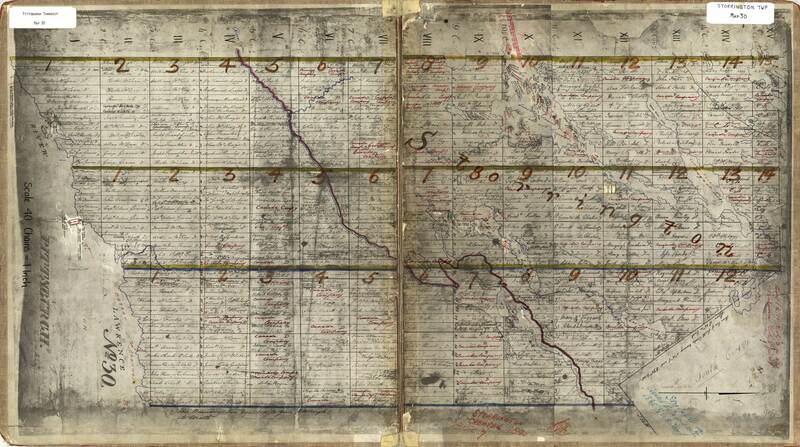 ), Frontenac Co.
See full map digitized online, and a description of the RG 1-100 records. Historical Atlases of the Varty Lake / Colebrook area of Camden Twp., Lennox & Addington Co. in 1860 and 1878. Shows properties of G. VanVolkenburgh at Con. 2 Lot 39 west of Colebrook. Note also the 1860 property at Lot 38 to the NW. For modern location, enter 44.383563,-76.800442 into Google Maps address bar. See a list of other nearby VV locations, including Gilbert VV's brother Paulus's property (and their Friends (Quaker) Meeting House to the north at Moscow. Illustrated Historical Atlas of the Ccounties of Frontenac, Lennox and Addington, Ontario, by J.H. Meacham & Co., Toronto, 1878. Compare to same area as depicted in the 1876 Walker Atlas. See the pre-1880 list of VV addresses here. At this year, 1857, John VV lived somewhere on Dundas Street and was a cooper. An account says he and his "brother" Henry VV, were employed at the T.J. Clarke Barrel & Stave Co. which was on one corner of Queen and Mill streets. Compare to same area as depicted in the 1857 Tremaine Map. Shows the approximate locations of various VV addresses on Dundas St. The circle at Mill and Queen Streets - one of these corners was the Thomas J. Clarke Barrel & Stave Co. Another circle shows the Roman Catholic church and first burial place of (at least) Flora VV before the cemetery was moved in the 1930's. See the post-1880 list of VV addresses here. (I am posting this on the 33rd anniversary of the F4 tornado that devastated much of this industrial and business area). Land locations of various VanValkenburgs in Eastern Ontario in 1865. From the private research notes of Dr. H.C. Burleigh (1893-1980), unsourced records - perhaps from a gazetteer or farmer's directory. A Storrington property, Lennox-Addington Co. is shown in 1860 and 1878 atlases here. The Camden East, Lennox-Addington Co. properties are shown in 1860 and 1878 atlases here. The Olden Twp., Frontenac Co. property is shown in 1860 here. The 1878 atlas doesn't seem to have included detailed views of the northern townships. The Ernesttown Twp., Lennox-Addington Co. property did not show a VV name on either atlas. Names were included on maps by subscription, and perhaps subscribers only paid to have their primary residences shown. Map (detail) 1863 W. Jones / Tremaine Atlas of Canborough Twp., Haldimand Co.
Shows the following Vollick/Follick properties located south of the village of Canboro in Canborough Twp. Compare this to the 1879 Page Atlas. Modern roads are indicated. These properties are owned by sons and grandsons of Sturm Vollick, an original Canby settler. The History of the Canby Settlement says that Sturm and his sons settled along the Darling Road about 1810. It is uncertain whether the original settlement extended as far south as on this atlas into the Clement Tract. If so, the George Follick property may be the land taken by his father Sturm. When the rail lines were built along the gore, the place where they converged and crossed Darling Rd. was known as a siding town called "Darling Road". See this section in relation to other Haldimand Co. Vollick/Follick properties. Map (detail) 1863 W. Jones / Tremaine Atlas of North Cayuga Twp., Haldimand Co.
Shows lots of Cornelius Vollick and James Vollick at Con 1 NTR (North of Talbot Road) Lot 17, west of Canfield village. Compare this to the 1879 Page Atlas and note the absence of the railroad through the properties on this earlier map. Map (detail) 1879 H. R. Page Atlas of North Cayuga Twp., Haldimand Co.
Shows lots of Cornelius Vollick and James Vollick at Con 1 NTR & Con 1 STR (North and South of Talbot Road) Lots 17. Providence Chapel cemetery indicated by red circle. Compare this to the 1863 Tremaine Atlas and note the railways built through Cornelius' property since then. The Haldimand Co. archives has many original land deeds pertaining to these two properties. In Cornelius's lifetime the rail lines were abandoned and the deed for the frontages returned to his ownership. Map (detail) 1879 H.R. Page Atlas of Canborough Twp., Haldimand Co. Compare this to the 1863 Page Atlas. These properties are owned by sons and grandsons of Sturm Vollick, an original Canby settler. The History of the Canby Settlement says that Sturm and his sons settled along the Darling Road about 1810. It is uncertain whether the original settlement extended as far south as on this atlas into the Clement Tract. If so, the George Follick property may be the land taken by his father Sturm. When the rail lines were built along the gore, the place where they converged and crossed Darling Rd. was known as a siding town called "Darling Road". Map - 1879 H.R. Page Atlas of adjoining North Cayuga & Canborough Townships, Haldimand Co.
South of Canboro, on the North Cayuga - Canborough township boundary in a community known as Darling Road. compared to same in 1863. Photos of some Vollick/Follick communities today. Map of Blaine Lake District, Saskatchewan showing location of "Vanville", 1909. From "Bridging the Years : era of Blaine Lake and District, 1790-1980", 1984. Samuel Card / Caird is shown living at Lot 21 Con XII Portland Twp. on the 1851 Agricultural Census (outlined in yellow). Nearby to the west in shaded yellow are Samuel's possible families of origin, near Moscow village in Camden Twp. A possible family of origin for Hannah Melissa VV may be Paulus VV and Meribeth Trompour. On this 1860 map, Paulus is living at the crossroads of Moscow village outlined in green. Other intermarried families near Moscow include: Patterson, Garrison, Switzer, etc. Another possible family relation for Hannah Melissa VV may be Geo VV-Eunice Mattis family. On the same 1851 Agricultural Census, George VV is living at Lot 13 of the 7th Concession of Portland Twp. On this 1860 map, that lot is outlined in purple. By 1861 George and Eunis had moved out of the township. * By the 1861 census, Samuel and Melissa had moved south to Storrington Twp. ; this may be why his name is not on the map despite him owning 200 acres. MAP of the locations of the mystery 'Battersea Brides' in proximity to the David VV-Lucy Miller-Storrington branch. Locations of Lavina VV-SEARS (pink), Julia Ann VV-LAKE (yellow) from the 1851 census, compared to locations of Quebec-based VV family David VV - Lucy Miller (green). Updated (salmon-colour) with the location of the family lot of Emma, widow of an Allan VV, who sold this lot in 1851, later purchasing a nearby lot in the same township. One child of this couple was born at Brewers Mills, a town on the east side of Cranberry Lake. The lots are shown on an 1860 atlas. By 1860 the Lakes had moved to the USA, and the Sears family was still at the Loughborough location, but not on the atlas, perhaps because Hezekiah Sears was a shoemaker and not a land owner? The lot to the north is Lyman Pixley whose son married a daughter of David VV. Also, for many years the Sears family had a VV man living with them, perhaps John VV, brother of David VV. No records yet have been found to prove blood relation of these mystery VV women to each other or to the David VV-Lucy-MILLER line. Research is ongoing. Map of Tyendinaga Twp., Hastings Co., Ontario, showing the farm of Charles Wright in 1878. The 1851 Agricultural Census shows Charles "Write" at Con. 5 Lot 39 and George Sexsmith at the same location. The 1878 Meacham Atlas shows Charles Wright still at the same location, and surrounding farms owned by sons of George Sexsmith. By censuses, it appears that George Wright and Wife Hannah VV-Wright lived here and farmed the property until shortly before their deaths. Map of VV locations in the community once known as Polmont, south of Havelock, Seymour Twp., Northumberland Co.
Shows property of Michael VV (1835-1926)at Con XII Lot 5, in relation to church, schools and cemeteries. Map notations by descendant Wayne VanVolkenburg. Map showing burial locations of Revolutionary Soldiers in Guilderland, Albany Co., NY. including John VV (father of Canadian VV branch intermarried with Loyalist families. For names corresponding to numbered locations, see "A Memorial: Places of Burials and Sketches of some Guilderland Soldiers of the Revolution and Records of Farm Burial Places in the Town of Guilderland, N.Y.", Wm. Brinkman, 1946. Shows the property of Nicholas VV (1797-1859) at Con I Lot 13 in 1858, and of the same lot owned by son William VV (1839-1901) in 1877. Shows the property of Hiram VV (1807-1877) at Con IV Lots 4 and 5, in 1857. Shows property of Michael VV (1835-1926)at Con XII Lot 5 in the north part of Seymour Township. VV Land Holdings - Erindale/Springdale, Toronto Twp., Peel Co.
Land records taken from William Perkins Bull family files, against 1859 Tremaine map and modern map. Pertains to Cornelius VanValkenburgh - Lois Davis and their sons in the 1815-1870 period.